Today we come with some mixed news about Intel's new 7X series chipsets for Ivybridge. 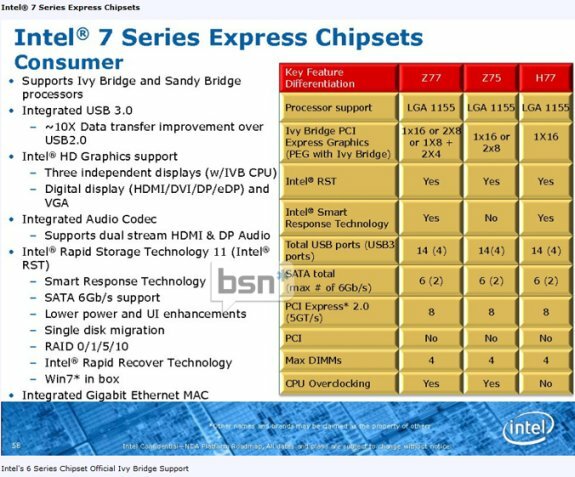 As you can see in the table below, there will be several different chipsets for Ivybridge as Intel traditionally makes three for a certain chip. On top of that, there are a few very interesting developments in the way of USB 3.0, SATA 3.0 (6G) and PCIe. When it comes to USB 3.0, Intel is finally going to support USB 3.0 natively which will save motherboard vendors money when building Intel chipsets and hopefully make the boards overall less complicated to design. In addition to that, we will hopefully see better USB 3.0 performance and possibly less variation between different USB 3.0 controllers that we have now. Took them 3 years to get with the program. Gotta love that "innovation" at Intel eh?